However, each robot was custom-manufactured, and at nearly US$3000, it never really gained a large user base. Now, via the Japanese crowd-funding site kibidango, the company has announced development of a new version of their desktop robot, PLEN2. 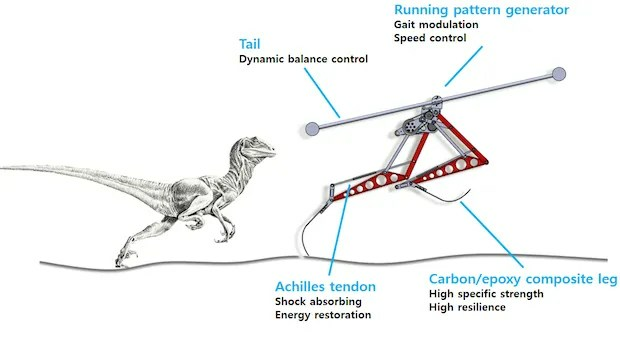 A research team at the Korea Advanced Institute of Science and Technology (KAIST) has built a small, 3-kilogram biped robot inspired by the velociraptor dinosaur. Although tied to a balance bar, the robot is able to run at 46 km/hr, roughly equal to the (also tethered) Cheetah quadruped from Boston Dynamics, claimed to be the fastest legged robot in the world. So it’s safe to say that the new “Raptor” robot is, at the very least, the world’s fastest robot biped. A Japanese chocolate company called Tirol Chocolate hosts an annual little robot competition for, well, little robots. The robots must be bipeds, but with no more than 2 servos per leg. Additional servos (not in the legs) can be as many as you like. In addition, the robot body must prominently display a Tirol Chocolate box (thus providing the sponsor’s benefit). The robots compete in three games: a foot race, a cup-shooting competition, and a candy-carrying competition. We previously reported on a very cool hack by Netherlands group Proof of Principle that crammed an Xbee transmitter neatly into a PlayStation3 DualShock controller. The DualShock is a great controller for any robot — especially a complex one like a humanoid — because it has a very large number of analog and digital inputs, it’s comfortable to hold and use, and it even provides tactile feedback via two vibration motors. But because it is a Bluetooth HID device, it can only be paired with something that can act as a Bluetooth master — and that’s a horribly complex task that requires a beefy computer. A Raspberry Pi can do it (just), but something like an Arduino? No way. And of course Bluetooth is only good over a distance of a few meters, even in a relatively quiet environment, so it’s of little use for controlling RC vehicles from a more reasonable distance. She had a point — you can actually feel how hard your ankles and legs are working, and how actively you’re balancing, when navigating such rough terrain. I think I mumbled something about how someday in the future technology would get there, and probably changed the subject.